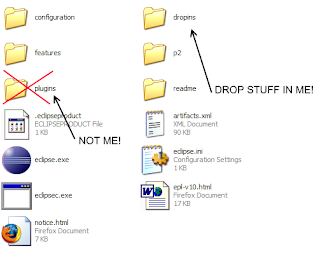 In the past, most people when they moved to a new version of some Eclipse project… we simply grabbed a new zip… unpacked it along with a new SDK or used the clever technique of link folders. It’s time to be using the p2 facilities to perform simple build-to-build updates. I have been doing this with the SDK recently and it works out nicely. When there’s a new update, I simply get the files I need using p2 and it does all the magic for me. The saying is that “old habits die hard,” and this is one habit that needs to change. In order to ensure the success of p2, it’s time to start eating our own dog food when it comes to updating plug-ins.